Our objective when first approaching this project was to leave no stone unturned, and to ensure that every detail, from safety, feature and function, to style, comfort and luxury…every aspect of this endeavor had to be just right. The fact is, you can find other solutions for “survival living”. Though none of the options today offer the peace of mind that comes with our state-of-the-art technologies, combined with the comfort and luxury that is offered through our Survival Condo ownership opportunity. Nothing even comes close. Full-Floor layout is approximately 1,820 square feet of living space. Half-Floor layout is approximately 900 square feet of living space. Each unit comes with a five-year food reserve per person. 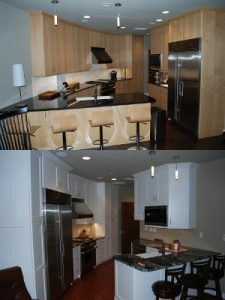 The Kitchens in each condo unit will feature high-end stainless steel appliances. The Bathrooms will feature Kohler bath fixtures and jetted Jacuzzi tub in each master bath. 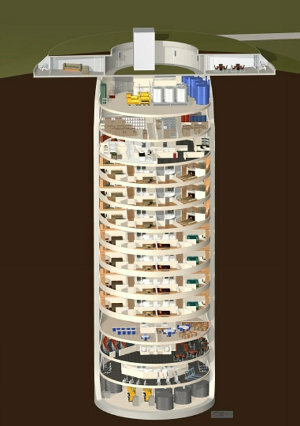 Only 72 Atlas “F” Missile Silos were built by the Army Corps of Engineers. These were the most “hardened” structures built and were designed to survive a direct nuclear strike. The upper section of the silo has epoxy-hardened concrete walls that are 9 feet thick. The dome structure that will cover the silo cap can withstand winds in excess of 500 MPH. The completed facility will have more than 54,000 square feet of protected space. The facility is designed to sustain 75 people for more than five years. The overall design finishings are “Ultra Modern” and the facility uses leading edge technologies. There is a full-sized pool featuring a massive wall mural and curved ceiling to enhance the feeling of space and height. The Missile Silo is capped by a monolithic dome. This dome is capable of withstanding winds in excess of 500 MPH, well beyond the winds of the most powerful F-5 Tornadoes which produce winds up to 300 MPH.